Nicole uses her illustrations in a variety of products such as greeting cards, bookmarks, fine art prints and more. 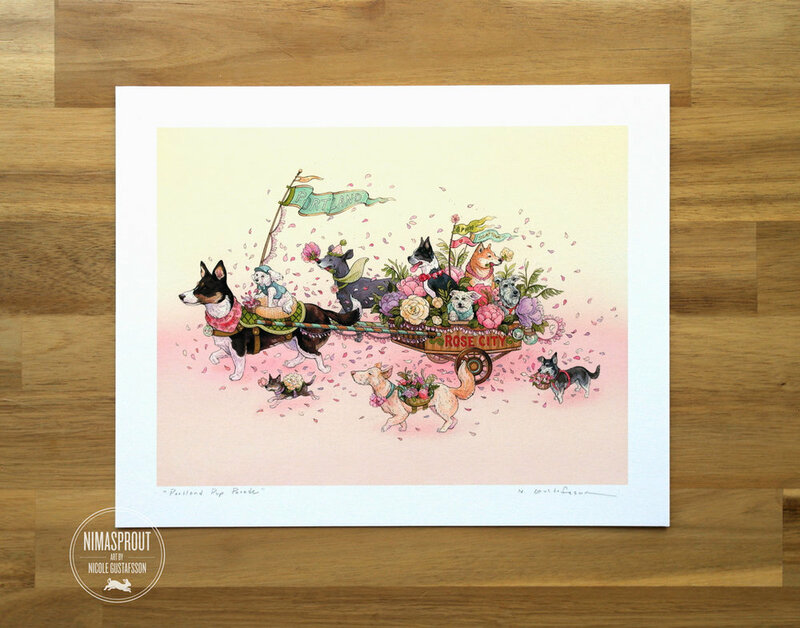 She has successfully ran her online business "Nimasprout" since 2008, much of which is shipped/fulfilled from her studio in the PNW. Nicole also works closely with other small businesses for retail, if you are interested in wholesaling her products, please use the contact form for more info! Nicole's whimsical greeting card line ranges from fruit houses with little animal characters for everyday hello's, to birthday cards to celebrate with those you love. Visit Nicole's shop to view her entire card line! Her cards are printed in the USA, with heavy weight paper with complimentary envelope. Nicole loves a good book and what better way to save your place than an illustrated bookmark. Animals reading are common themes in her bookmark line, Nicole offers a range of colors and images to compliment your bookshelf. Fine art prints are at the heart of Nicole's business. Most small prints are producted in her studio with the highest quality inks and papers to ensure longevity of the print.